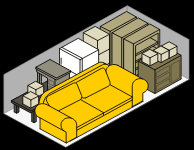 5×10 – Size of a walk-in closet. Holds contents of a typical studio apartment or works best for business files and records. 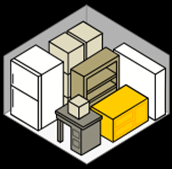 10×10 – Holds contents of a one-bedroom apartment including appliances, plus boxes. This size is also convenient for business records storage. 10×20 – The size of a standard one-stall garage; often used for automobile storage. Holds contents of a 2-3 bedroom home. 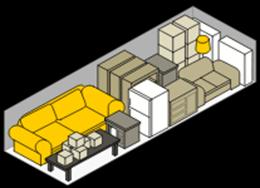 10×30 – Sufficiently stores contents of a 3-4 bedroom home. Also good for storing an automobile or boat/trailer and having space for additional items. We also have units that are 10×40 – This is actually two 10×20 units next to and against one another, allowing you access at both ends. Easily accommodates a 4-5 bedroom home with appliances.